I messed up (again), go figure. But life is about digging deep and making something better or growing from your mistakes. For my last market I tried to take shortcuts (hello a big blinking sign reading, “Potential Lesson”) on a Pumpkin Chocolate Caramel Bark. It did not set up. Hmm…. 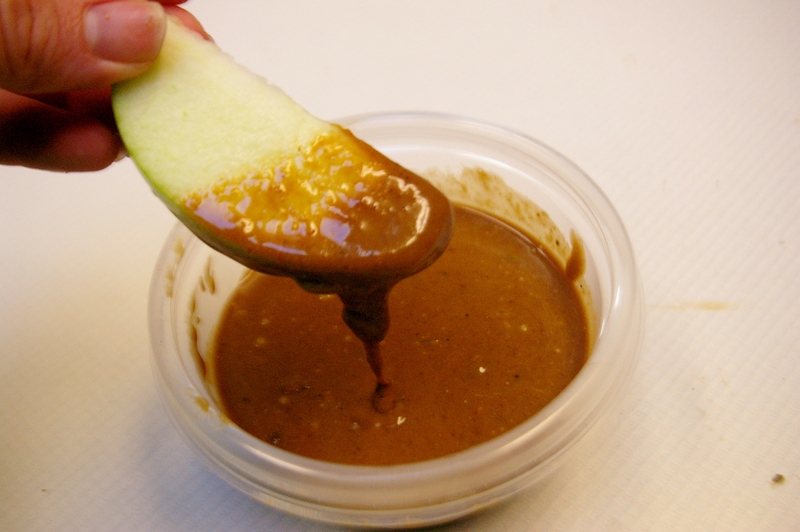 it is caramel after all, what if we keep this simple and dip a crisp green apple in there? PERFECTION! My mom is a big granny smith fan and this little added bonus is right up her alley. There was a layering of flavors with the pumpkin and spices that created depth to keep it from being your average caramel, plus tis the season for caramel apple and pumpkins, why not combine them? Duh, here have at it. Let’s Make it Happen: Bring coconut sugar and honey to a boil in a pot. Add coconut oil, stir until it melts. Toss in the coconut milk. This is where I didn’t go with it. Let this cook and get nice and hot, 290 degree hot. Remove from the heat, when it finally stops it’s bubbling, add in the pumpkin and and pumpkin pie spice. Spread onto parchment (I lined a pan and put it in there). Sprinkle with almonds, pumpkin seeds, and sea salt. Freeze. Pull it out, slice some apple and dip to your hearts content!